Spread each graham cracker square with 1/2 tablespoon of peanut butter. Top two of the graham cracker squares with pear slices. Sprinkle lightly with cinnamon. 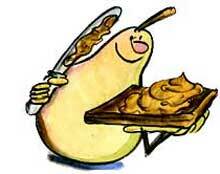 Place the remaining graham cracker squares, peanut-butter-side down, on the pear slices. Serve. Exchanges per serving: 2 starch, 1/2 fruit, 1 other carbohydrate, 1 high-fat meat, 1 fat. Carbohydrate choices: 3 1/2.